Eyre Street around 1900. Photo courtesy of Camden Local Studies & Archives Centre. Little Italy: the phrase puts you in mind of carbonara, the Corleone family, and Clerkenwell. Hang on — Clerkenwell? Hmm. Little Italy is a big and powerful cultural myth — but the streets of EC1 aren’t normally part of it. It’s more of a New York thing, surely? But, believe it or not, an area of inner London centred around Clerkenwell Road, Farringdon Road, and Rosebery Avenue was once the home of thousands of Italians. Their numbers peaked around the end of the 19th century — and there are only a few traces left of them now. So where did they go? We decided launched our own investigazione. The scuola guida. Photo by James FitzGerald. 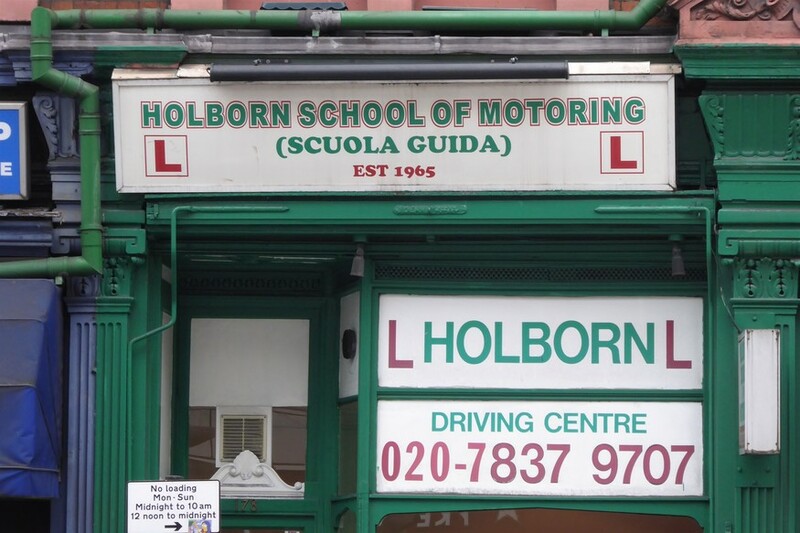 An Italian driving school located at a central London crossroads seems improbable for all sorts of reasons, but the scuola guida near the junction of Clerkenwell and Gray's Inn Roads has stood there since 1965. The Holborn School of Motoring nowadays caters for the broadest range of nationalities imaginable and enjoys its location near several London universities. Urdu and Albanian are among the other languages it’s come to advertise, alongside Italian. Once a local resident, an instructor called Richard remembers a time when it was possible to take driving tests around here with an interpreter. 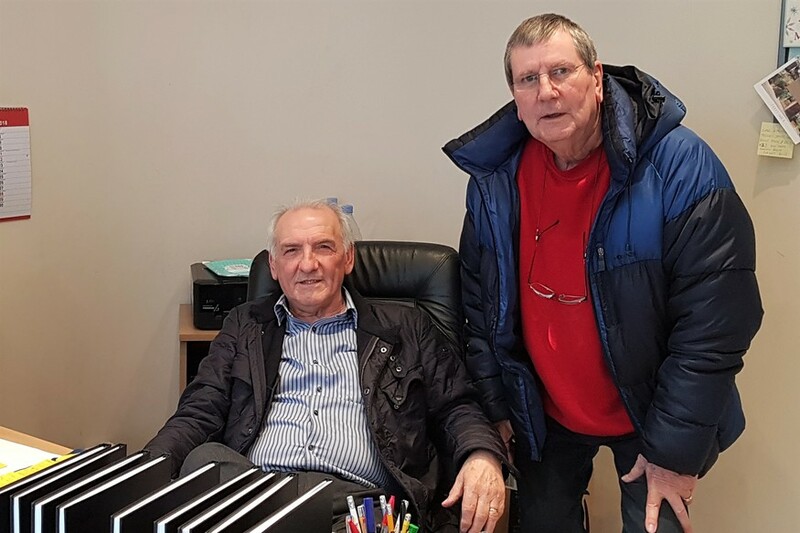 Classes in Urdu and Albanian: Vittorio and Richard of the Holborn School of Motoring. Photo by James FitzGerald. 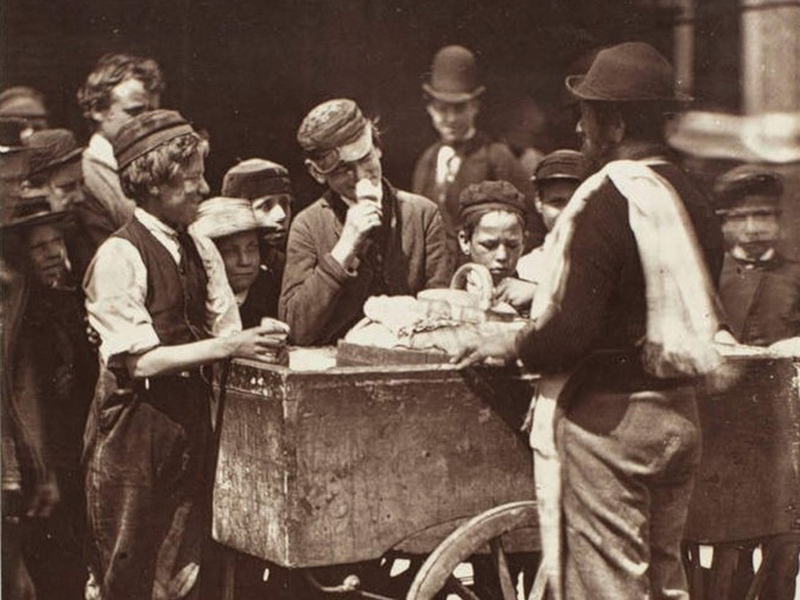 An ice (cream) seller at work in 1877. Many of them were based around Saffron Hill, at the heart of Little Italy. Photo courtesy of London Metropolitan archives. Varani is not alone in thinking of the Little Italians as having been a highly aspirational group. “They came in different waves for different reasons,” historian Tudor Allen tells us. “Little Italy was a rather complex society that built up in the 19th century. The first arrivals were skilled workers from northern Italy. Clerkenwell had an established centre for craftspeople — and these migrants would have made quality instruments — looking glasses, thermometers, barometers. 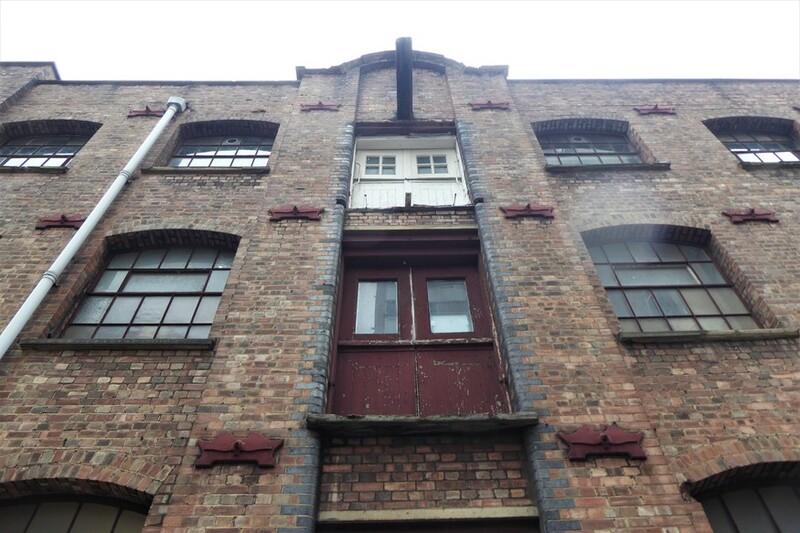 As the Senior Archivist at Camden Local Studies and Archives Centre, as well as the author of Little Italy: The Story of London’s Italian Quarter, Allen knows the neighbourhood’s history in great detail. Criminality did little to boost the Italians’ image. Gangs and protection rackets were formed; the fearsome Charles “Derby” Sabini becoming the local Godfather. Relations between different communities proved uneasy. One of the most shocking crimes in the area came in 1880, when an Italian man fired shots at a Polish priest who was borrowing the Italian church to give a Polish Mass. 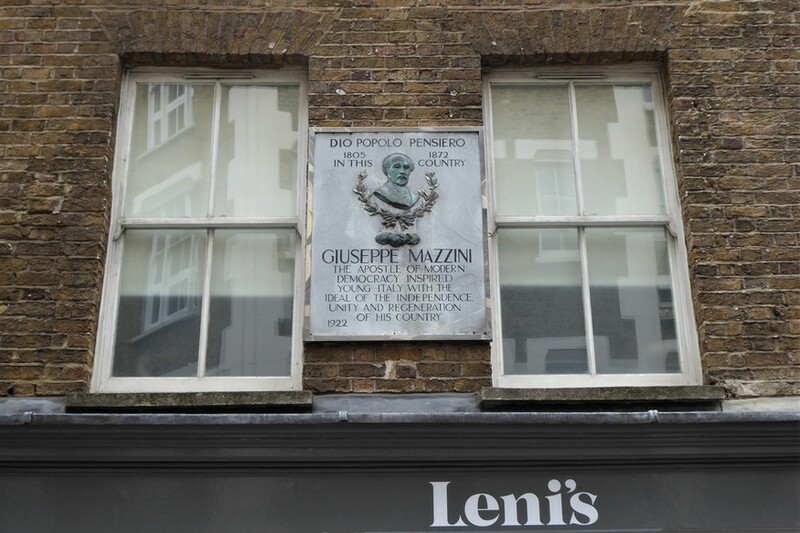 A plaque on Laystall Street pays tribute Giuseppe Mazzini - a key figure of Italian unification. Photo by James FitzGerald. “But they weren’t all street musicians, ice cream-sellers, or mobsters,” Allen points out. 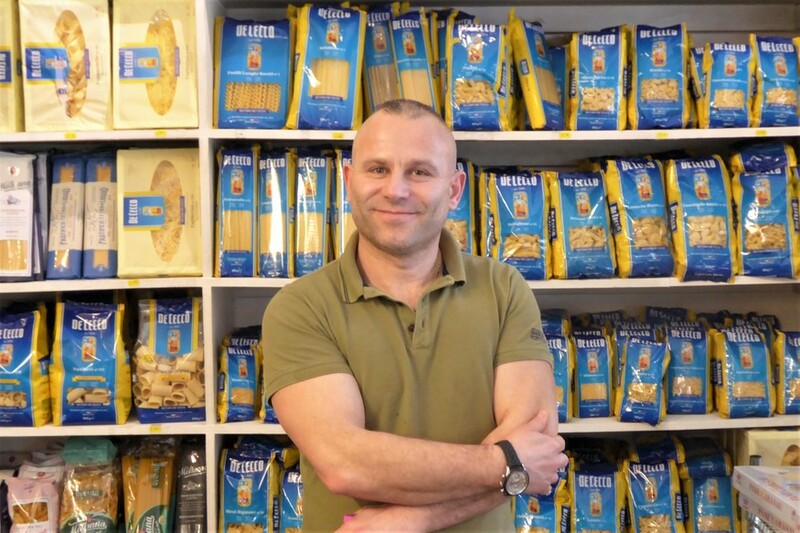 “There’s a danger of oversimplifying Little Italy. “Take the political revolutionary Giuseppe Mazzini — a key figure in the Italian unification in the 19th century. He came to London as an exile, with a death sentence over him at home. He co-founded a social club here and set up a free school to help poor Italian children. 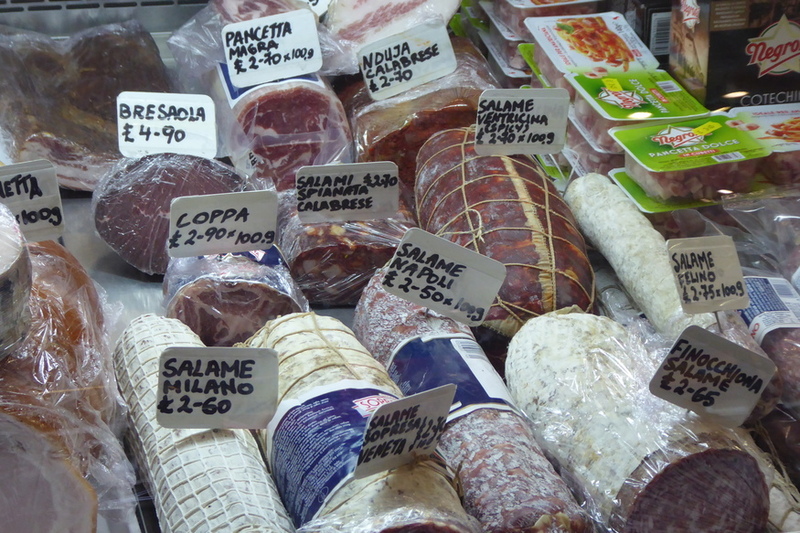 Inside London's oldest Italian deli. Photo by James FitzGerald. The scents of pecorino, pesto, and parma ham mingle devilishly to pull you in to Terroni, the first Italian delicatessen in the capital. Its founder, Luigi Terroni, is said to have walked here from Italy and set up the business in 1878. These tastes and smells are comfortingly timeless sensations within the sea of cranes, construction, and change that is modern-day Clerkenwell. “There’s a lot of development going on,” observes present manager Felice Sula. “Shops open and close, but Terroni is still here. And it’s very important to this part of London that it does stay. Master of pasta, Felice Sula. Photo by James FitzGerald. That the little deli has to battle so many outside pressures to keep that Italian tricolore flying high is a bit of an echo of the fortunes of Little Italy as a whole. 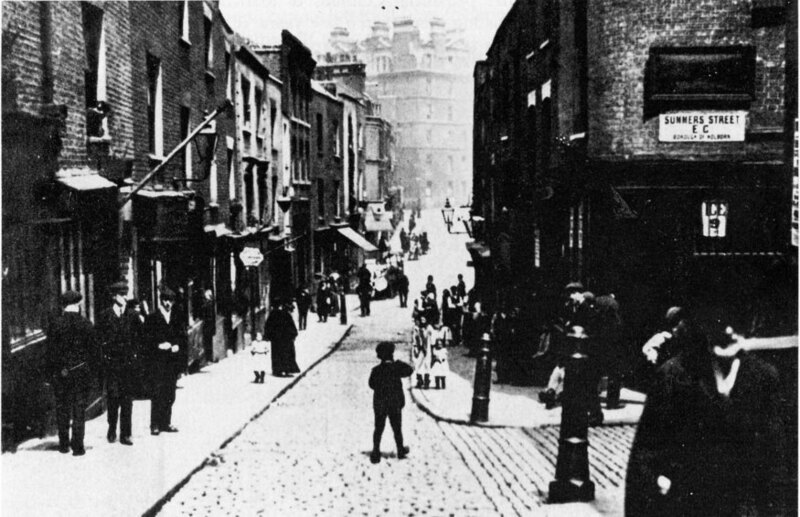 Clerkenwell underwent slum clearance, road-building, and property development in the early 20th century, all of which gradually dispersed the Italian population. The second world war proved equally detrimental to the enclave. Inner London was heavily blitzed, while many Italians — viewed as enemies of Britain — were sent to prison camps. “I never saw Little Italy but I’d have loved to,” muses Felice. “There are so many pensioners who come in and talk about it all the time. They’ve got great memories of how the area used to be. 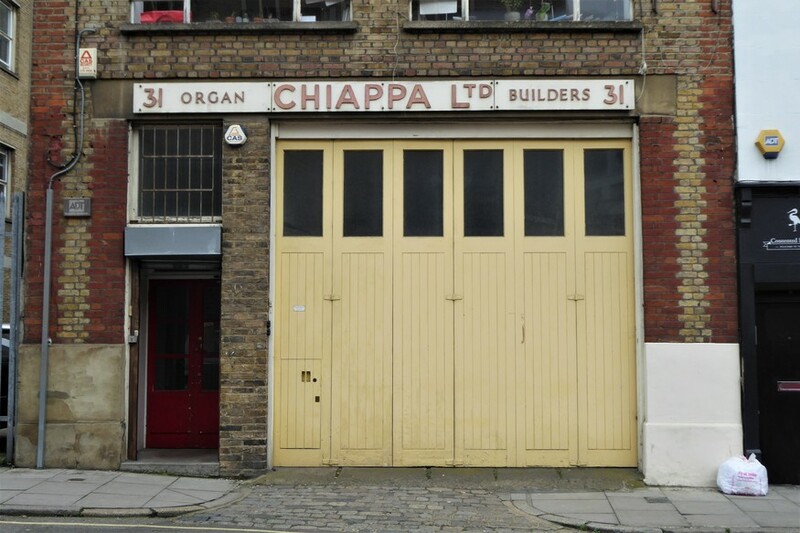 An organ-maker's is among the few local businesses that bear witness to the Little Italy of old. Photo by James FitzGerald. While there are clearly one or two Roman relics to be treasured in Clerkenwell even today, the consensus is that ‘Little Italy’ is fast becoming the stuff of legend; doubtless one embellished over time. After all, the enclave experienced its fundamental changes about a century ago — decades before the Irish enclave in Kilburn did, or the Bangladeshi one around Brick Lane did. 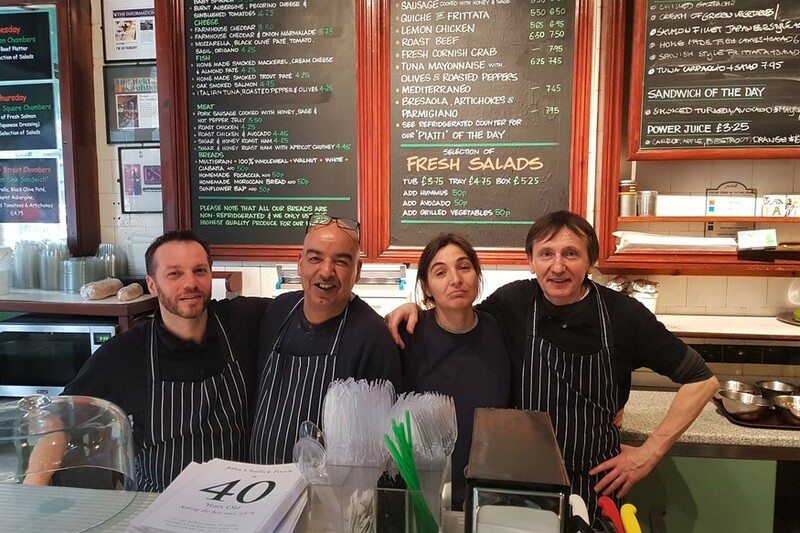 A Moroccan, a Spaniard, and several Italians form the team at sandwich bar John Charlick Foods when we visit on a hectic Friday lunchtime. Over a piercing Americano, owner Luigi tells us how the area looked in the 1980s. That’s when he left his home near Turin and came to London. An Italian, a Moroccan, a Spaniard, and another Italian walk into a sandwich bar... Stefano, Khalid, Maribel, and Luigi of John Charlick Foods. Photo by James FitzGerald. “There was a crazy Italian in the corner shop,” he says. “Another up the road. But, to be honest, even thirty years ago there weren’t many of us left. You just got told stories about the old days. “Italians used to control some of the pubs around here. The gangs were formed because if you were a foreigner, you came to London and people picked on you. Scootech. Photo by James FitzGerald. We notice the local branch of modern pizza joint Malletti has a mural inside advertising “a slice of Rome in Clerkenwell”. Some well-researched marketing… or pure chance? It’s a mistake to assume every last flash of green-white-and-red spotted around EC1 nowadays is a remnant of Little Italy. At the end of the day, nowhere is the appetite for la dolce vita greater than in modern London. But how much does today’s Clerkenwell knowingly acknowledge its history? Just like your author, John Rusby is about as Italian as a plate of spaghetti bolognese. 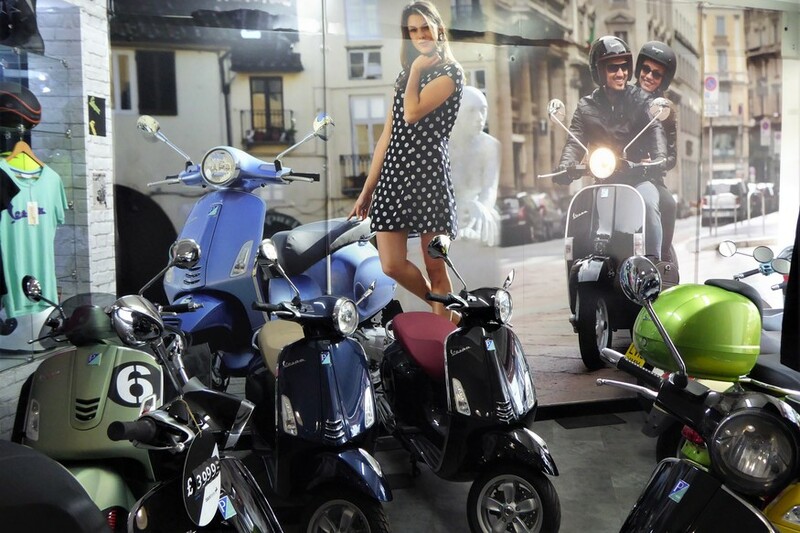 But he is passionate about Italian craftsmanship — and runs a Vespa scooter dealership at the heart of what was once Little Italy. “It’s a happy coincidence,” he admits. “We only got here in the early 2000s. But the location does help.” Scootech has built a strong client base of City workers, many of them of Italian and French. The rusticity of this once-industrial quarter has long been attracting new businesses. Photo by James FitzGerald. Antony Brown at Paesan restaurant. Photo by James FitzGerald. Set up in 2013 at the gateway to Exmouth Market, Antony Brown’s Italian restaurant Paesan is another business that ended up locating near to the former Italian enclave by a fateful twist. “My father’s side of the family has been in catering for decades,” he tells us. “So it’s in my blood, and the blood of people who work here. They’re all Italians. It was in Little Italy that Brown’s grandparents met. His dad was born and bred here, even becoming a page boy at the Italian church. 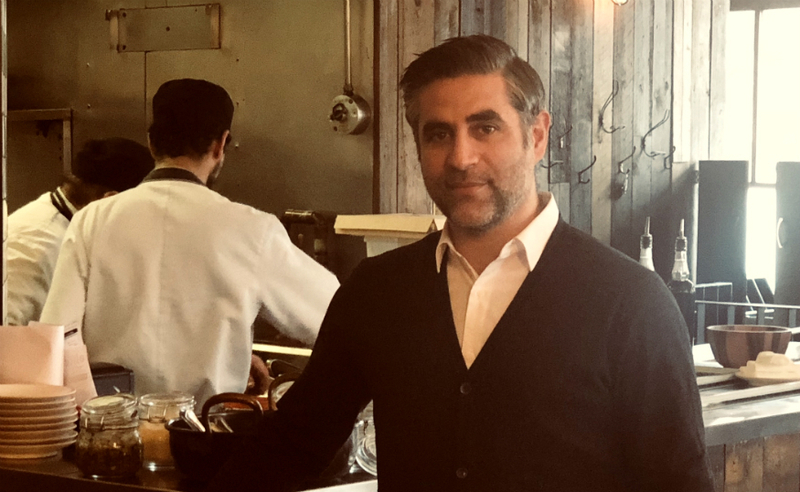 Brown says his impression of that historic immigrant community is of simple integrity — something he looks to replicate in his back-to-basics eatery. 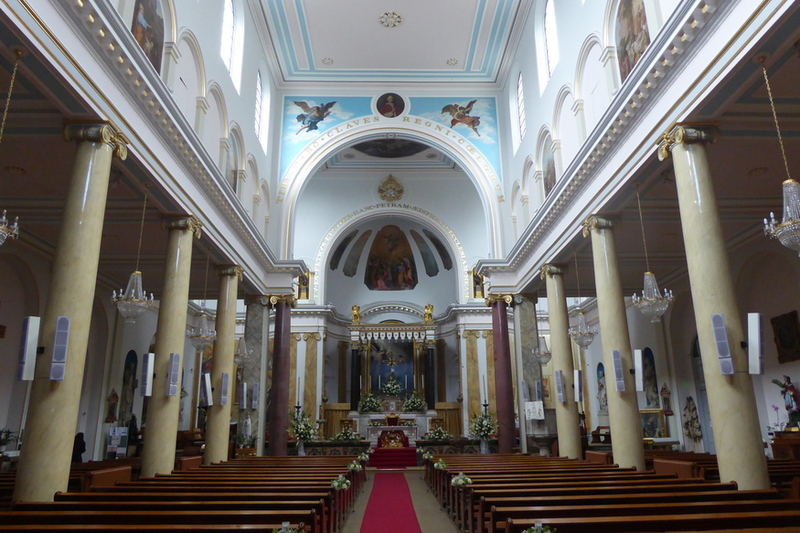 St Peter's: London's first Italian church. Photo by James FitzGerald. People who work here today talk about a weekend effect. An older generation who remember Little Italy seem to surface in the coffee shops before and after Sunday Mass at St Peter’s Church. It’s a charming thought. Memories of the ‘Old Country’ have mostly faded in Clerkenwell, with the passage of time and the spreading of the Italian population. Does that make it doubly difficult for a religious institution — let alone one so linked to the area’s history — to appeal to young people? 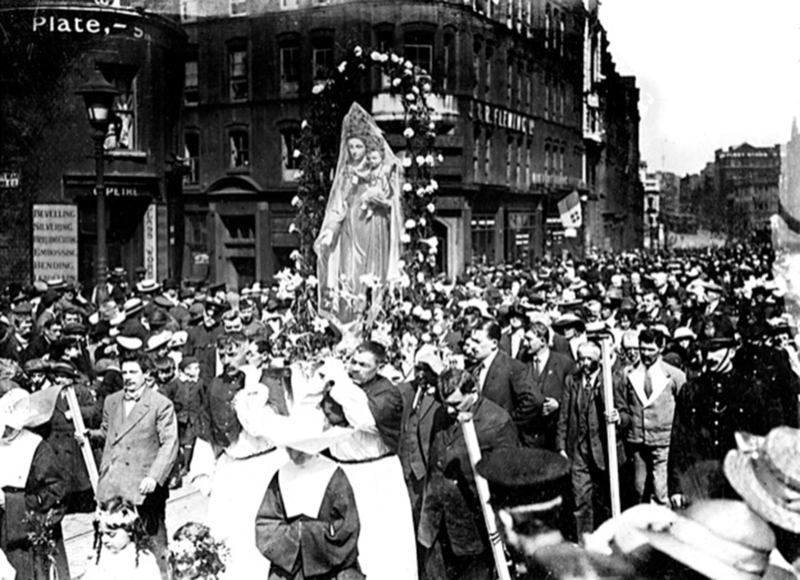 Clerkenwell's famous Italian procession, pictured in the 1930s. Photo courtesy of Peter Bertoncini. The church’s July procession is famous for being the first outdoor Catholic celebration allowed in London for centuries. It got the go-ahead from Parliament in the 1880s. “Relations are easier nowadays,” says Father Andrea. “You see, there are some things about Little Italy that have got better over the years.